After my last post i found a truly great video on Youtube. The video is a short interview from Milton Glaser to a university on Skype, with his views on plagiarism. This gave me a new in depth view on plagiarism or referencing in his work, as he mentions he used a style that duchamps had previously used in his Dylan piece. Well worth a watch even to try and se Glaser as a person. So for my first 3000 words, i think i should just focus on my research. If i can get a better understanding of plagiarism in the community, and how it is being received by artists, i can then develop my own opinion on the matter, and further discuss how a change in views is necessary with a change in time. I feel that my first 3000 words are not quite dissertation ready, more of me just blurting out all my research onto a page and not quite organising it well enough. It will need to be refined and looked at for the next stage of the process. I am looking forward to some feedback from this to see if this was a better track to pursue. I am a great admirer of Milton Glaser’s work. He is a true inspiration to me, and has produced some fantastic works for many different clients. His services are so sought after that he doesn’t need to look for work, work finds him. This is the stage of designer i want to become, world recognised work. So during my dissertation, i have taken to try and look at how Glaser references other artists and designers in his own work. For this I need to research him as a designer and look at his life. I have found many books on the great man and many websites. I have researched a brief background from this website http://www.areaofdesign.com/americanicons/glaser.htm. Looking through some of his work, it is clear that referencing is a major part of it. Glasers dylan poster is a prime example. A picture of bob dylan that he has adapted into his own style, but so much so that the image is only recognisable because of the profile of the man. The debate was sparked from the Barack Obama picture/poster creation. Had Fairey changed the original image enough to call the new piece his own, original work. When looking at a piece such as this, it is hard not to look back at an artist of equal calibre, Andy Warhol. His work, much in the same way as Fairey’s, uses images and changes them ever so slightly. His Monroe image even more so because all he added was colour. This begs the question, does the time of these two pieces affect how they are received in the art community? Why was it so acceptable for Warhol to, possibly, plagiarise and not for Fairey? When clearly Fairey has changed the original image more than Warhol. This is an interesting point that the dissertation can look more in depth into. Following some email feedback from my tutor, I have decided to change my dissertation title completely. 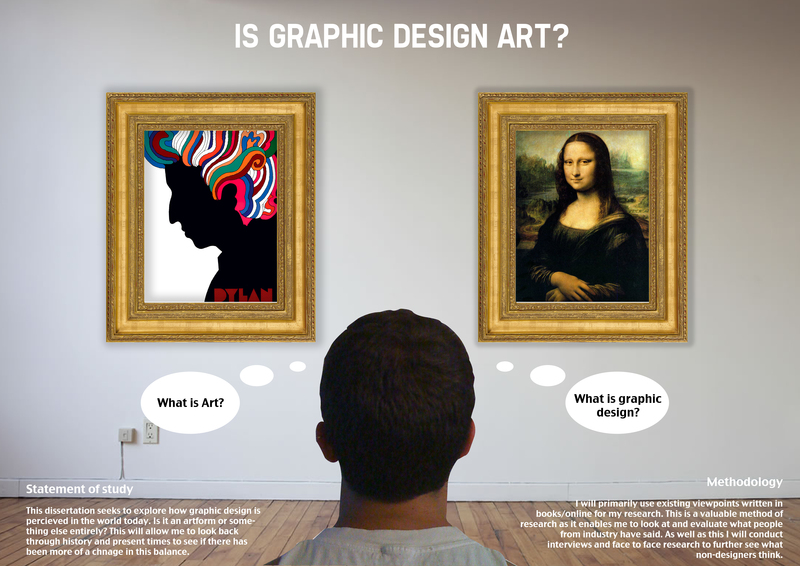 The title I had picked ‘Is graphic design art?’ had been too vague. There was too much that could be talked about and so much that has been talked about, that a fresh approach from myself could not be made. So from this, and from the email, i picked up on a word that my tutor mentioned, plagiarism. This is a subject which is strong within design community and throughout the business world. This could be a good place to make sure I know what to expect from employment. Also with referencing becoming a more and more fluid concept in todays society, this will be an interesting topic to write about. For my first way point I have to write 3000 words so I am going to try and get some research done and look at particular artists and designers. This way I can see how they use referencing and how they avoid appropriation. I would also like to get some opinions on plagiarism from people in the field and also a simple consumer. To help create our own CV’s we have been told to look at some designers CV’s that have already been made. I have been trawling through the internet to find some. Here are a few of the ones that I liked the most. I liked the blue silhouette design as it is bold and aesthetically pleasing. The blue is very stand out and allows for white text to be placed on top. The only downside to this design is that there is far too much text going on and a prospective employer would not be willing to read through all of it. The orange design I like because again, aesthetically it is nice and appealing. This shows off his skills as a designer for the employer to clearly see. The information is clear and not too cluttered with useless information, just the essentials. It clearly shows what programs the designer can use by showing the logos of the applications. The last design is a fully designed and shows the designers skills off to the maximum. It shows him as a graphic designer and an illustrator. I do enjoy the design of the CV but I think it is too much for just a CV. Here is the final outcome of this process. I feel that the design has turned out better than i thought and simple enough not to be too cluttered. I feel the whole concept of the dissertation is conveyed well enough for someone to look at the poster an understand what it is about.